I wrote Cory Doctorow the other day "complaining" that I would have random interesting ideas flit through my head and realized they were all snippets from his intriguing fiction (and sometimes non-fiction). He response: "pwned!" 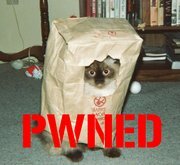 I was almost "pwned" last Sunday and yesterday when a flaw in awstats 6.2 and earlier, the program I started using partly because of Cory et al. at BoingBoing to perform traffic analysis, allowed a bunch of Brazilians to pwn sites all over the Internet. Luckily, the root kit--a prefab package for taking over a Web server when you have local user access--disabled all access to my computer when it ran rather than allowing access. A later check using rkhunter found no rootkits or replaced binaries. But I'll be watching. By the way, I don't believe there's a connection between the theft of my credit card number and the attempt to take over my machines. I don't store credit card information on those servers, including my own.